Spencer Lau was quite proud of his pride of lions, his cackle of hyenas and every other group of animals he’d put on stage. 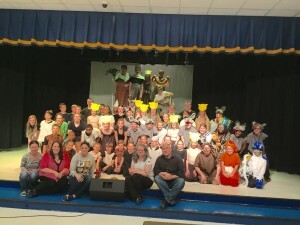 For Lau -- the music director at Woodruff School in Seabrook, New Jersey – is one of the first directors to bring Disney's Lion King JR. to a middle school. He did it wondrously, shepherding his cast of fifty-one onto a modest stage. Lau and his operation – ACE Music – belied that kids were involved. Even the Playbill had a touch of professionalism not seen in middle school. Where on this level do you ever see in a program “Understudies never substitute for listed players unless announced at the time of the performance” followed by the names of five understudies and three swings? Last Saturday, however, no one was out (unlike many a Broadway production we could name). These kids wouldn’t have missed the chance to perform for their parents, relatives, friends, and even Baayork Lee. Yes, the original Princess Yaowlak in The King and I and Connie in A Chorus Line – and one of Spencer Lau’s biggest fans – was there. 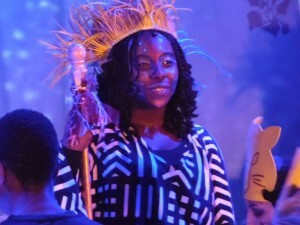 We knew that we were in good hands as soon as Janae Atkins came on as Rafiki, for she proved to be astonishingly adept at doing the African chants that Tsidii Le Loka had devised for the original production. But then we wondered. Like it or not, girls are still the backbone of school musicals, and of Disney's Lion King’s fourteen specifically named characters, nine of them are parts for males. What’s more, Mufasa (Lion King One), Scar (Lion King Two) and both Young and Grown Simba (Lion King Three) are all demanding roles. Even in this Junior edition, which retains fourteen of the score’s twenty songs, girls or women are only involved in five of them. Well, as the show says (and as Swahili people have been saying for centuries), “Hakuna Matata” – which, as most of us knew when we walked in, translates to “There isn’t a problem.” Donny Yamasaki’s Mufasa had genuine gravitas; Connor Max Wetherington made a scary Scar; Eddie Fleetwood was such a wondrous Young Simba that we hated to see him give way to Grown Simba, although Cole Everingham showed us that we’d still be in good hands. But given that Zazu is a hornbill, Timon a meerkat and Pumbaa a warthog, these characters certainly didn’t need to be played by Woodruff boys. So Micaela Marroquin, Emily Lancetta and Ashley Birdsall bounded onto the stage with can’t-wait-to-begin zest. The passion and enthusiasm they showed was all the more remarkable in that they never overdid it, got cutesy or succumbed to look-at-me-itis. None was remotely a ham—even Birdsall, although she was playing a member of the pig family. Even with his gifted cast, Lau faced another potential barrier: costumes. Of course, no middle school production can hope to replicate the wonders that genius director-costume designer Julie Taymor brought to Broadway. But Shirlee Idzakovich met the challenge with solid solutions. Plain ol’ cardboard supplied the lions’ headdresses, but to represent the grasslands, foot-long expanses of green shafts rested perpendicular on boards atop the kids’ heads (and fit them to a “T”). Hoodies have taken a lot of heat in recent years, but the one here was reconfigured into a bird’s head. Hush puppies for shoes, boas to simulate fur, beanies with antlers attached and of course leopard-skin patterned fabrics all helped to make quite the menagerie. Although Taymor had a great many masks on long springs that moved in front of an actor’s face when he suddenly looked down, Idzakovich drew the line there. Her fine solution was to give each major character a walking stick which had at its top a mask that represented his genus and species of animal. There’s that old canard that kids in your audience won’t sit still for ballads, but Nakai’s voice was so beautiful and secure that nary a peep was heard from the crowd. Even the infants that some parents brought were quiet. That was hardly the extent of Nakai’s contribution to Disney's Lion King JR. She did the choreography as well. This was brave of Lau, for giving a teen a responsibility usually bestowed on an adult could have been risky. Instead, the results were exciting and revealing. 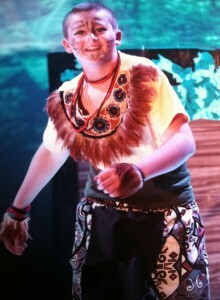 Seventh-grader Nakai delivered first-rate choreography. One reason why Disney's Lion King is the fourth-longest running show in Broadway history (and will be in third place before the end of the year) is that Roger Allers and Irene Mecchi’s book speaks to kids so fervently. “I just can’t wait to be king,” says Simba. “I’ll be free to do it my way.” Well, yes and no, as all adults have found since they’ve passed childhood. As Mufasa tells his son, “There’s a lot more to being king than getting your way” – and lot more to being an adult, too. Of course, as we’ve all learned from The Fantasticks, “Never Say No” to kids, for that command alone is enough to make them defiant. Simba strays, leading to Mufasa’s “You deliberately disobeyed me? !” What kid can’t relate to that? Little does Simba knows that he’ll soon get to go to places he’d never wanted to visit, after Uncle Scar convinces him that he caused his father’s death and that his only recourse is to run away. This brings up one of the many valuable lessons to be had in The Lion King. You shouldn’t run away from your problems. In fact, you almost always can’t, for you’ll be haunted by your failure to solve them. Avoiding responsibility, however severe, is not the answer. Rafiki comes forward to tell Simba “You can run from the past as well as learn from it” – words we all need to heed. Simba’s innate nobility makes him right his wrongs. He’s also merciful to Scar when he doesn’t have to be. Of the songs retained in the Jr. version, the most resonant is “He Lives in You.” Here’s a nice balm to kids and adults who have lost beloved friends and relatives. Everyone can indeed keep these people alive by living by the best principles that they possessed. Connor Max Wetherington acknowledged as much in his Playbill bio when he said that he “dedicates this performance to his grandmother Grammy. She loved to watch his performances and he knows she will be watching from heaven.” Granted, Grammy may have been the most pleased by what she saw, but there’s an excellent chance the rest of us were all tied for second place in admiration. Lau also pointed out that he usually stages a show in twelve weeks, but because the hot-off-the-press scripts didn’t arrive until February, he had to do this one in half that time. This proved to the kids the theory that “Work takes as long as the time you’re given to do it,” and that the definition of being professional isn’t limited to your being paid, but in how you conduct yourselves. 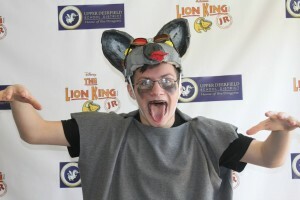 “Between now and the end of the school year,” Lau announced, “eight to ten schools a week are scheduled to do Disney's Lion King JR.” Here’s hoping that the others can begin to match what happened last weekend in Seabrook, New Jersey. You may e-mail Peter at pfilichia@aol.com. Check out his weekly column each Tuesday at www.masterworksbroadway.com and each Friday at www.kritzerland.com. 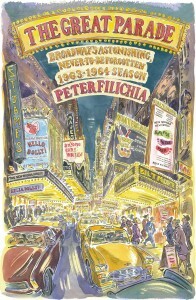 His book The Great Parade: Broadway’s Astonishing, Never-To-Be Forgotten 1963-1964 Season is now available at www.amazon.com.